Hello and Happy Wednesday! Today’s project is one that we’ll be making at one of my Stamp Club Meetings tonight. 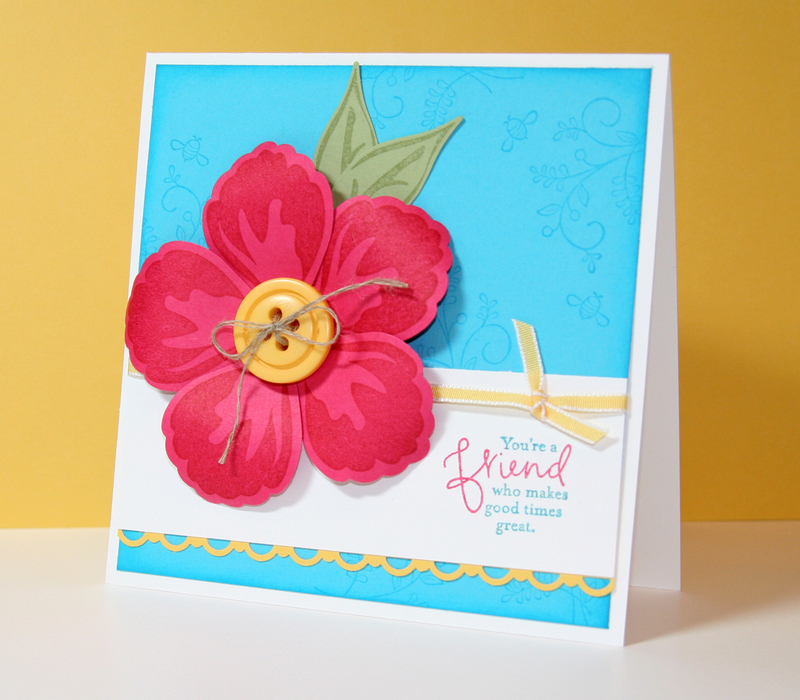 I can’t get enough of the Build a Blossom set, it makes cardmaking so easy and quick! Love it! When I sat down to make this card, I knew what I wanted to do but I had no idea what color combo to use. I wanted it to be happy and cheery, so I was going to make the flower using Melon Mambo, past that I was stuck. So… I consulted my handy Color Coach. It is amazing, I love the changes Stampin’ Up made to it to make it so much more user friendly and inspiring. I just started thumbing through it, looking at each color combo that included Melon Mambo until I ran across this one. The Color Coach recommended Melon Mambo, Daffodil Delight and Tempting Turquoise. I threw in the Pear Pizzazz for the leaves and this is how it turned out. I don’t normally work with all bright colors, but I found making this card refreshing. I can’t say enough good things about my Color Coach. I bookmarked this sweet card a while back (and pinned it to Pinterest as well), and I finally got around to making a CASEd version this weekend. It was such a cheery way to spend a spring-like day, particularly after a not-so-cheery week, so I wanted to say thank you for the inspiration!